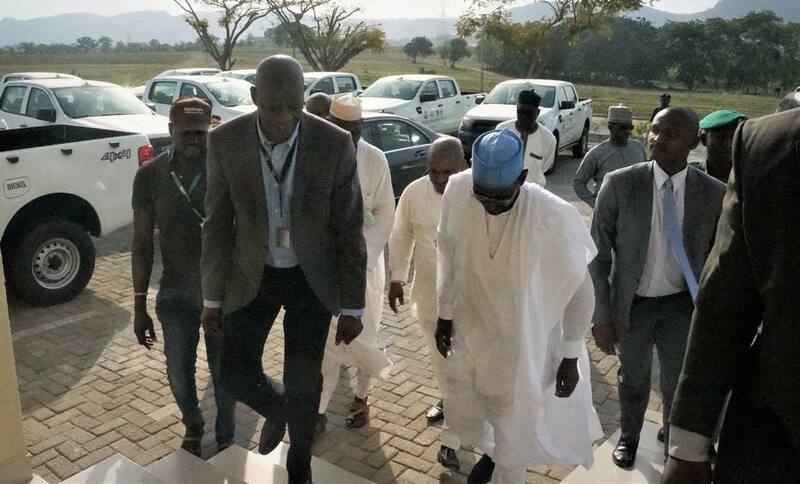 Nigeria’s Minister of the Federal Capital Territory Administration (FCTA), Honorable Muhammadu Bello, visited the IITA-Abuja Station recently. The Minister, who was accompanied by the Secretary of the Agriculture and Rural Development Services Department of the FCTA, Honorable Nzekwe Ifeanyichukwu, and top officials in the Ministry were received by the Head of Station, Gbassey Tarawali, Beatrice Aighewi, Patrick Adebola, and other members of staff. While welcoming the Minister, who was the first ever FCT Minister to visit the station since it was established in 1991, Tarawali gave a presentation of IITA’s work in Nigeria and sub-Saharan Africa in the last 50 years, as well as the history of IITA Abuja. Tarawali and the management team led the visiting Minister and his team on an extensive tour of the station with stops at the yam barn, the Aflasafe exhibition, the plantain sucker field, the stream, and the boundaries of the station, where he saw first-hand the great work that is being done in the station, as well as some of the challenges. The Minister expressed appreciation to IITA for the warm welcome he received. “We would do our best to support you (IITA). We will find a way to help you tackle your challenges,” the Minister assured Tarawali. Bello mandated the Agriculture Secretary (who is a Commissioner of Agriculture) to expedite action to address some of the challenges in the Station which include the need for a perimeter electric fence. In conclusion, he expressed the commitment of the administration of President Muhammadu Buhari in revamping the nation’s agricultural sector, and emphasized that agriculture remains the biggest contributor to Nigeria’s GDP.